When I attempted this bread recipe for the first time I made a happy little mistake. The instructions called for chopped cranberries, and I just threw them in the batter whole. Well, those cranberries did what cranberries do - they bobbed to the top of the batter and floated on the surface. I thought I'd really messed things up, but I baked the loaves anyway. 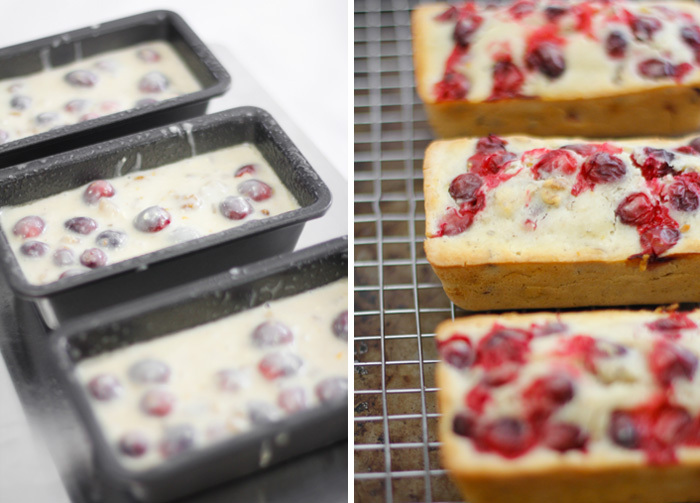 They turned out tasting absolutely fantastic, and the burst red berries on top made the bread vibrant and beautiful. I ended up making this recipe twice more. It's dense and sweet and so citrusy. 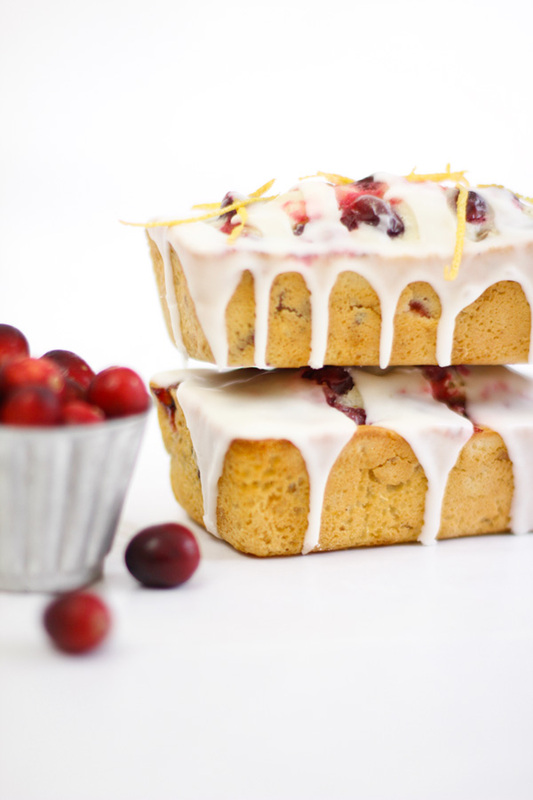 Every bite is packed with something to savor; tart cranberries, walnuts, and candied orange peel. The recipe makes one 9 x 5-inch loaf, or three mini loaves 5.75 x 3. I prefer the mini loaves because the reduced bake time yields a less dense crust. 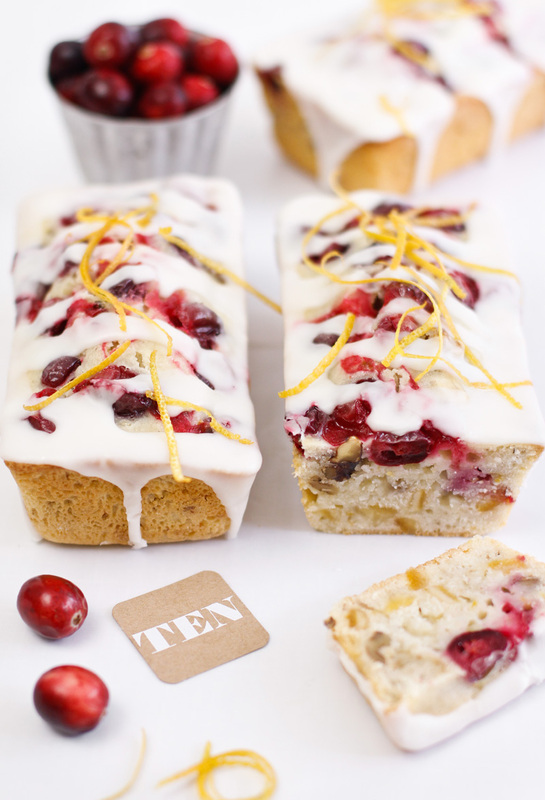 You can find the Wilton loaf pans I used here. The pans have a nonstick surface already, but I needed some extra insurance. A spray of cooking oil made the loaves pop right out without a snag. I've enjoyed this bread many times for breakfast with coffee. It has a triple dose of orange flavor with the candied orange peel and orange zest in the batter, and the glaze on top is made with freshly squeezed orange juice. It's a good time to take advantage of all the beautiful winter citrus available now in grocery stores! Preheat oven to 350F. 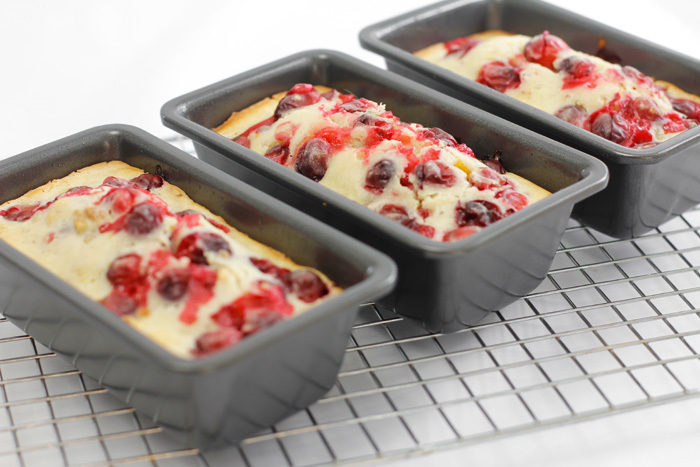 Spray a nonstick loaf pan (8x4 inch) or three mini loaf pans (5.75 x 3 inch) with cooking spray. Combine flour, sugar, baking powder, salt and baking soda. Add butter and mix until crumbly. Add the candied orange peel and orange zest. Add the buttermilk and egg; stir until moistened. Add the cranberries and nuts. Pour the batter into the prepared pan(s) and bake until a knife inserted into the center comes out clean. For an 8-inch loaf pan, bake for about 70 minutes; for mini loaves bake for 30-35 minutes (check at 30 minutes). Loosen the loaf (or loaves) from the sides of the pan and transfer to a wire cooling rack. When cool, prepare the glaze by combining the OJ, powdered sugar, and enough extra OJ to create a thick drizzle. Drizzle the glaze over the loaf and let set, about 1 hour. A large loaf can be gifted in a large gusseted bread bag. Smaller loaves can be gifted in small gusseted candy bags (available at craft stores). Um... 12 cups of walnuts? Was that perhaps supposed to be 1/2? Ha! 1/2 cup. Thank you. This sounds amazing. It looks so pretty and festive too. This looks delicious and festive! I will definitely be making this and sharing with friends and loved ones. Does anyone know what "candied orange peel" is? Can you get it at the local supermarket? At what temperature do you make this? I'm thinking 350, but your notes and recipe doesn't say. Will the glaze stick to a bag or wrap for mailing? Is it feasible to mail the glaze in a separate container for spreading upon arrival? I'd love to send this to family, but I would hate for it to arrive a sticky, soggy mess... ideas, or just make cookies? My girls and I use lots of your recipes for our cottage baking ministry;thank you for the fabulous and beautiful recipes! Hi @Landonfamily! I'm delighted to know you and your girls make my recipes! The glaze will harden if you let it stand for a few hours. You could also give the loaves a powdered sugar crust much like stollen - brush loaves liberally with melted butter, sprinkle with powdered sugar - brush again with butter, sprinkle a second layer of powdred sugar. This transports well. The stollen I buy imported from Germany has this crust. You could aslo ship the glaze separately in a disposable piping bag (tightly closed with a rubber band). Maybe include directions "snip the end and drizzle over bread". Thanks for your questions! I am making these for gifts...and the sample batch was yummy! With the orange juice in the glaze, should these be kept refrigerated? Hi! I do not refrigerate my bread - but it also never lasts beyond three days (we eat it quickly!). If you're making it ahead of time, say, 3 to 4-ish days ahead, then I'd refrigerate the loaves until you're ready to give them. Then bring them to room temperature before you hand them out. My batter came out very thick not running at all. Very hard to find candied orange peel. I was so looking forward to it, but disappointed. Michelle, did you bake the bread? If ever that happens again with a quick bread recipe, add more buttermilk 2 tablespoons at a time to loosen it a little. Having said that, this batter shouldn't be runny like cake batter.